Sunday was a tough day for underground anti-Kremlin opposition leader Alexei Navalny — and not just because he was thrown to the ground by a half-dozen Russian cops on Moscow’s main boulevard, then shoved into a waiting paddy wagon feet-first. 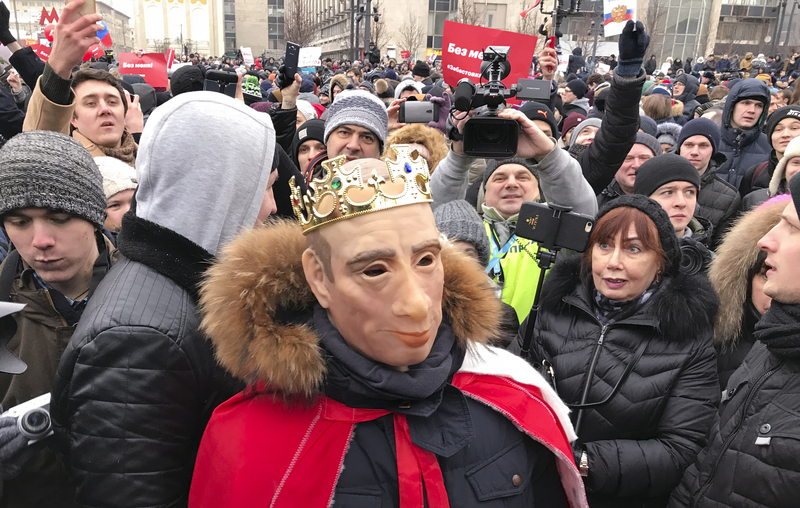 Navalny had a bigger problem: Despite weeks of hype, the nationwide protests he launched to support a boycott of Russia’s March presidential election drew just a fraction of the massive crowds that turned out for anti-corruption protests in the first half of 2017. Now, as election day inches closer, the lack of momentum revealed over the weekend poses troubling questions for a campaign that seeks to undermine the legitimacy of Putin’s regime by roundly embarrassing him — if not actually defeating him — at the ballot box, analysts told VICE News. In Moscow, Navalny was joined by roughly 3,000 protestors, according to one estimate by Meduza, an independent news outlet. Law enforcement figures put the nationwide total at roughly 4,500 people. That’s a far cry from the number who turned out on March 26, for example, when various estimates put the country-wide figure from 32,000 to as high as 93,000. The protests were indeed widespread — taking place in over 80 cities throughout Russia, including in Yakutsk, where temperatures approached -50 degrees Fahrenheit. And despite the roughly 350 arrests, for the most part, Putin’s regime let it all happen. While Navalny was arrested, the cops didn’t even see fit to hold him. He was released a short time later without charge. He’ll have to face court later, according to his lawyer, and if charged and convicted of organizing an unlawful assembly, he could face 30 days in prison. What surprised people this time was that Navalny actually made it to the demonstration for a few minutes before the cops caught up with him. “They usually don’t even let Navalny get to the protest before they arrest him,” said Olga Oliker, head of the Russia and Eurasia Program at the Center for Strategic and International Studies. The Kremlin might’ve kept a cool cover in public, but across town, the police broke into Navalny’s headquarters with power tools, claiming they were responding to a bomb threat. The break-in happened while Navalny’s allies were live-streaming a news broadcast on his popular YouTube channel — creating a moment of ludicrous, dark comedy as the presenters stared into the camera while the police power saw wailed through the wall behind them. But overall, the police response was muted compared to earlier events — suggesting, analysts said, that Russian officials are getting better at suppressing the leaders of a protest while avoiding the negative images generated by widespread arrests. “They’ve trained the cops to do this better, and make it look a bit less like they’ve stepped out of a George Orwell novel,” Oliker told VICE News. Navalny is far from a spent force, however, analysts said, and added that it remains to be seen whether he’ll indeed be able to reduce turnout in the March election to any noticeable degree. Putin’s victory in March, of course, is seen as a foregone conclusion. The real battle now, Russia-watchers say, is over voter turnout. The Kremlin is hoping to secure a high participation rate that puts a shine on Putin’s re-election. Meanwhile, Navalny is trying to saw the legs out from under Putin’s regime by convincing Russians not to take part in the election at all, which he calls an orchestrated sham. One reason for the smaller demonstrations this time, analysts said, might be Navalny’s somewhat convoluted message. The anti-corruption crusader was effectively calling on people to rally in the streets in support of just doing nothing later, pointed out Aaron Schwartzbaum, founder and editor-in-chief of the Russia-focused newsletter, Bear Market Brief. But a silver lining for Navalny, analysts said, may be that protesting against Putin in the streets could come with painful repercussions in Putin’s Russia, including run-ins with police or at work. By comparison, simply declining to vote may be relatively painless.